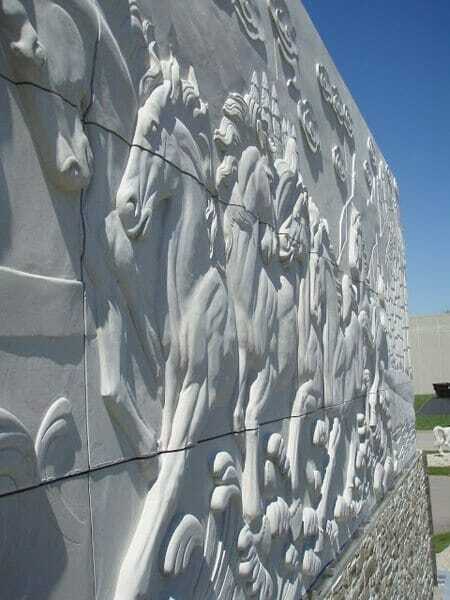 Besides offering a wide variety of traditional stone veneer from honed to rock faced finishes for residential or commercial exterior cladding, we also have the unique capability of creating large scale relief sculptures such as the magnificent 14 tall x 48 long relief sculpture of galloping wild horses that adorns the side of our Kaukauna, WI design showroom. In ancient times sculptors used relief carvings to create friezes that illustrated stories of heroic battles, chronicled the deeds and accomplishments of royalty, paid tribute to the Gods, or told religious scriptures. Before the printing press or paper was widely used for documentation, friezes were a means of recording history or story telling with a visual medium that could be seen and understood by all. Relief sculptures are a fantastic way to illustrate a story like sculptors did in ancient times. Think of them as a mural in stone. One that will never fade or need to be repainted. By using multiple panels you could create something relatively small or massive in scale. The possibilities are endless really. Think of some of the possible applications like a landscape or nautical scene in the interior of a home, the founding fathers of a business, college, or other institution in the lobby of a building, members of a teams hall of fame on their stadium walls, decorative banding like floral designs or scroll work for exterior accents on a home, and many other options. In order to show the beauty and versatility of relief sculptures we decided to design a large scale relief sculpture for the side of our design showroom. 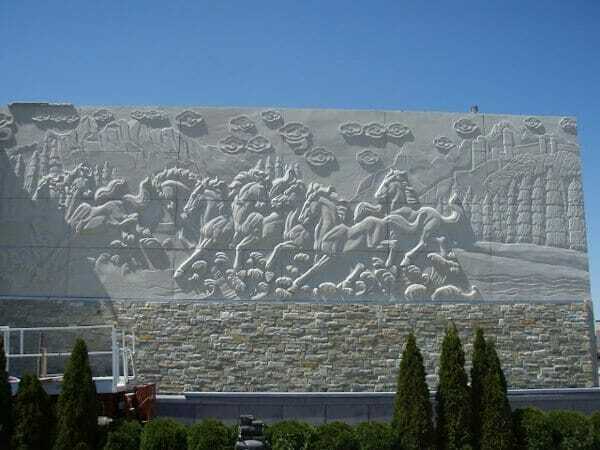 A galloping herd of wild horses runs through a river bed near a pine forest on the relief carving was carved with spectacular attention to detail by our artisan sculptors. Unlike a mural, the scene really comes alive with the depth and shadows created by the muscular legs of the horses, the water splashing beneath their feet, and the trees and mountains beyond them in the background. The strudy structure of our metal stud construction warehouse was a perfect candidate for the additional structural concerns posed by the heavy 4 x 8 panels which were 3 thick. 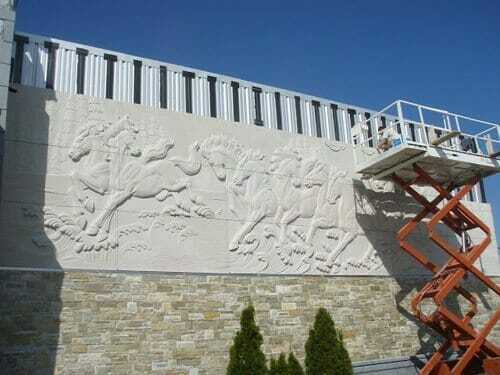 This article will walk you through the installation process of the relief sculpture. 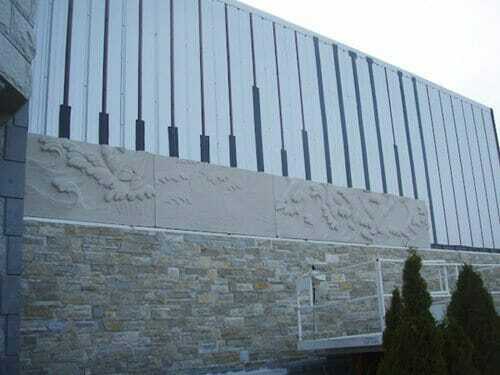 Because the aluminum siding of the warehouse posed no threat for rotting beneath the stone veneer like wood if water got trapped behind the panels, we purposely left a gap behind the relief panels so any water could just drain out behind them. We applied rubber sheeting over the seams of the aluminum siding to seal it before the veneer panels were installed. Each panel was hoisted into the air and one of our crew stood on the scissor lift next to the wall to guide the panels into place. The first panel is set into place. This gives you an idea of the thickness as well. Because of the weight of the panels it was decided that an adhesive based installation wouldnt be proper. 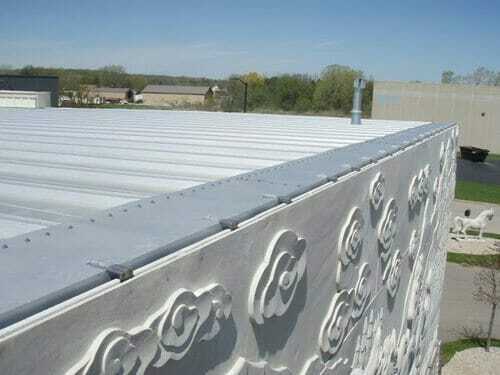 The weight of the panels was too great and a soft joint would have had a greater chance of failure and popping panels off the wall due to expansion and contraction. Instead we determined that purely mechanical fasteners would be the best method. A grove was cut on the top and bottom of the tile to allow a bracket to hook the tile into place. After the brackets were bolted to the studs we filled the grove with silicone to prevent water from accumulating in the groove and freezing and causing damage to the tile edge. Each bracket was bolted into the studs at about 18 of space between them. 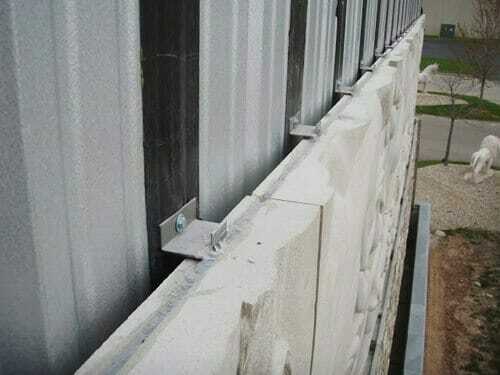 Clips are integrated into this roof edge flashing that holds the relief securely in place. And here’s a closeup look at the incredible detail of the hand-carved sculpture. Please Note: This article is only a general overview of the installation process and is written for informational purposes only. 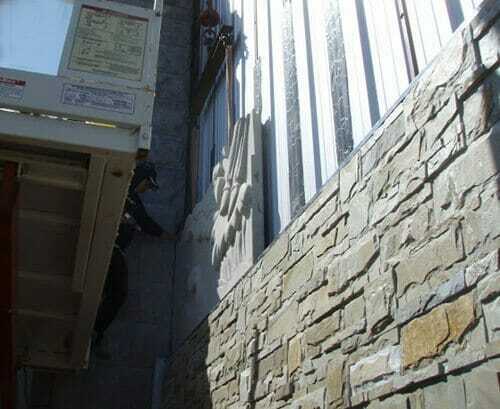 Proper adhesion methods vary based upon the material, weight per tile, building substrate, and state and local building codes.All veneer should be installed by licensed professional builders or masonry installers.Consult with Architects and Construction Engineers to ensure that the Installation methods will meet code and safely support the weight of the stone veneer. Looking for something similar for your home or business? Contact us today to see what we can do for you. Carved Stone Creations is located in Kaukauna, WI and we are a reasonable drive away from many Midwest metro areas including Milwaukee, Madison, Chicago, Indianapolis, Fort Wayne, Minneapolis, St. Paul, Grand Rapids, Ann Arbor, Traverse City, Davenport, Des Moines, St. Louis, Kansas City, Cincinnati, Columbus, etc. Visit our showroom to see first hand what we can design for you. Our convenient centralized location also means we can bring all of the tools and heavy equipment we need to tackle any installation job. We understand the affect our harsh Midwest winters can have on exterior stone work and we design and install architectural stonework like fountains, statues, exterior stone veneer, etc with those factors in mind. 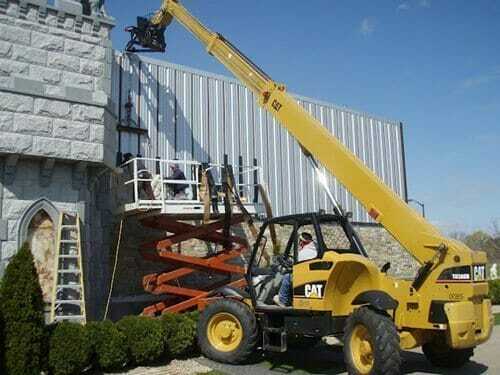 Well make sure the stone work we install for you stands up to the weather and the test of time! Outside of the Midwest? We can install there too. We have done work from New York to Florida to California as well.